If you’ve been to Venice, but can’t stand the prices, there’s a place you can go where you can get a great taste of Venice at a reasonable rate. The place? The Dalmatian Coast – a region on the eastern Adriatic, dotted with thousands of wonderful islands, palm trees, beautiful scenery. It is a place the Venetians once conquered and built up, and much of their architecture remain, flavored by the Croatian (and former Yugoslavian) influences of this century. 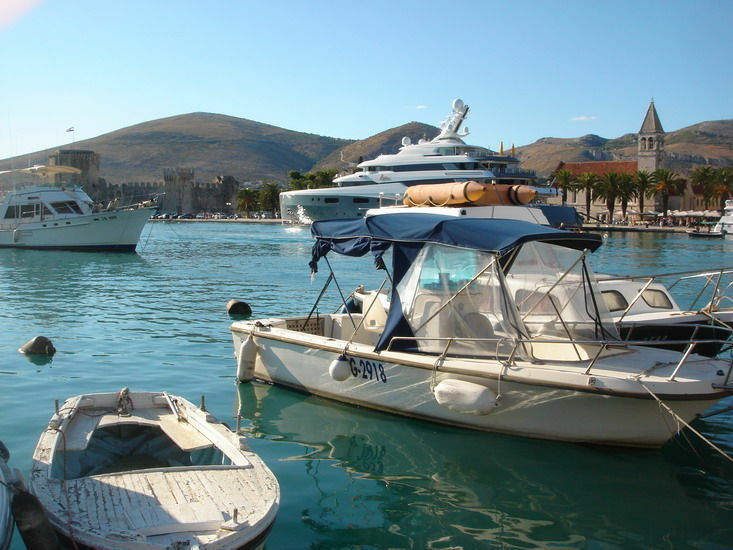 Trogir is one of the Dalmatian Coast’s wonders. It is a small island just north of the major Croatian city of Split, separated from mainlain Croatia by mere canals. The entire island has been built up like an old fortress, complete with high walls and towers. Its streets are wafer-thin and cobblestoned. In short — it is like a small bit of Venice, but less crowded and less expensive than its more popular neighbor across the sea. The city has several major features — such as the Trogir Castle — the outer city wall, three large churches, and a large inner marketplace dominated by a massive clock tower and theater. As is the case with similar cities in Italy, Trogir is a virtual maze of tight streets amidst tall buildings that snake around at many angles. Many of these buildings are beautifully decorated and ornate, reminiscent of their Venetian origins. Just be careful when wandering through the city, you might not find you way out! But once you do, you might be ready for a nice cup of capucchino or a tasty Italian pastry. Trogir has a long stretch of marina cafÃ©s, like the one under the palms and overlooking the canals. Trogir also sports a number of excellent Italian restaurants, serving authentic pizza, seafood, and pasta at bargain-basement prices. Trogir is also very picturesque at night. Trogir has an active nightlife, with a number of popular dance clubs and bars. Also, there are several other night spots across the canals on the mainland, with theaters and other attractions. The surrounding area has a number of large marinas and marketplaces that are worth exploring. Some of the most interesting buildings, such as the wasserturm (water tank), have not yet been restored, but since Croatia’s independence, the Dalmatian Coast has thrived through tourism such that Trogir has several active renovation projects underway. It is a great place to go now, and will only get better. Restaurant “Capo” is charming family restaurant placed in the center of Trogir Old Town. It is well known and recognized by many tourists and locals as “something different”.